We welcome back Thalia and her deeply rooted approach to the art and science of undulations and belly rolls. This workshop will focus on subtle technique for full body and isolated undulations including the spine, arms, hands, and abdomen. A technique discussion and combinations will familiarize students with the muscle groups and breath patterns that make undulations exciting for both dancer and audience. And if everyone is very very well behaved, Thalia will show you how to flip quarters using just your abs! Come see Thalia perform at Figaro on Sun. Jan. 20! A wonderful opportunity to study with this great teacher (one of Ranya's mentors), who rarely teaches in Manhattan. 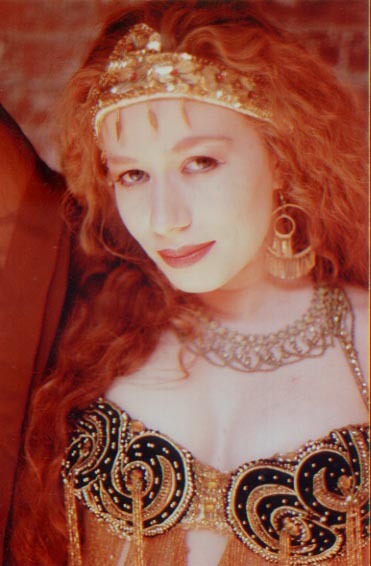 Shoshana will teach elegant, exciting choreography to the classic Egyptian opening piece "Nebtedi (minein el hekaya)". She'll offer combinations that work nicely for the different musical changes in the beginning part of this piece: hipwork, traveling steps and veil work, focusing on dramatic presentation. Thorough warm up and preparation at the beginning of class. The choreography will be taught and continued in the second week. LOOKING FOR A LITTLE "ZILL THERAPY"? Don't panic! You are not alone: We all need some zill therapy now and then. Many otherwise competent dancers lack confidence in their cymbal playing. And yet cymbal playing is key to getting an audience excited and grabbing their attention. When you don't feel confident, you don't play in public, and then you don't get the experience you need to succeed. We'll go over the basics for a strong foundation, and build from there. So no matter what your level, come join us, get practice, and build confidence in your playing in front of others-in a friendly atmosphere with honest, helpful feedback. Back by popular demand, this series is a refinement of last year's workshops that explored different aspects of character in performance, using "method" and physical acting exercises and applying them to our dance. We will be working our way through the topics over the four-week series. How to be the "Hostess with the Mostest", giving the gift of your performance without expecting anything in return, and also how to receive the gaze of your audience while you take a bath in the spotlight. Focus on different kinds of eye contact and Breathwork for Performance. You can make payment online via Ranya's website, or pay in person on your first day of attendance.